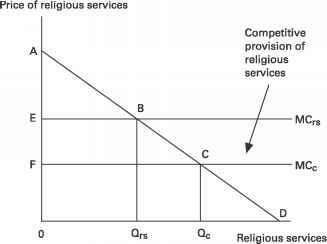 The conventional model of the decline in rent seeking occasioned by Protestant entry into the religion market is, however, understated (by, for example, the area ABPp in figure 8.2). In order to appreciate this we must note that medieval economic development in Europe usually occurred most dramatically in cities that contained major churches or cathedrals. The great era of cathedral building in Europe was between 1140 and 1280, but the tendency of cathedrals to promote local expenditures persisted for many centuries. These spiritual temples were financed by contributions that were sometimes voluntary and sometimes forced. Understandably, there was intense local competition for cathedral sites. 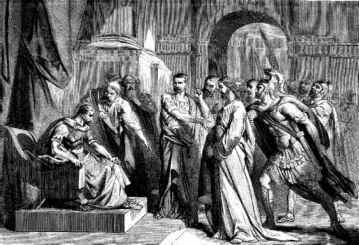 The glory and legitimacy of monarchs—which over this period owed more to the support of the papacy and their largely political representatives (the bishops of a region) than to the feudal aristocracy— depended on church support, in large measure because bishops were at the very top of the feudal hierarchy. According to medieval historian Georges Duby these "prelate-businessmen... owned the best lands and enormous barns which the tithes exacted at each harvest filled to repletion. They levied taxes on urban fairs and markets and part of the profits from trade and agriculture found its way into their coffers____[T]he social order of the time was so constructed that peasants and middle class were expected and enjoined to deliver a large part of their earnings to the military and ecclesiastical authorities. ''16 While some such "donations" were, in view of redemption, "voluntary," many were not. The forced nature of such contributions is revealed in periodic revolts against bishops who pushed taxation too far. Duby reports that in 1233, infuriated by the exactions of an earlier prelate, the bishop of Reims's flock rose up against him and forced him to close down the work yards for a time and to dismiss the masons and sculptors in his service.17 Although contributions might appear to be "voluntary," the amount of "forced demand" is debatable. Thus, far from simply being a place of worship, the medieval cathedral was a multipurpose structure with some of the characteristics of the modern commercial mall, union hall, court house, and amusement park. Competition, in medieval times and in our own, almost always has a locational component. Urban centers with cathedrals vied fiercely for relics and works of art to adorn their churches.21 In the manner of modern sports stadiums, medieval cities engaged in a kind of spatial competition for ever grander cathedrals that inflated the costs of providing religious services of all kinds, including assurances of eternal salvation. In this as in all economic matters, the true cost of the cathedral was the opportunity cost of resources used in its construction and maintenance— the opportunity cost of stone masons, artists, and saver-investors whose human and physical capital resources were directed to the provision of religious services. By de-emphasizing cathedrals, Protestantism thus reduced a second kind of rent seeking. Figure 8.3 represents the cost inflation from cathedral building. MCrs lies above MCc, indicating that the cost inflation from spatially competitive cathedral building lies above the true competitive cost. As figure 8.3 reveals, the Protestant Reformation not only reduced rent seeking on the demand side of the church provision of services, but reduced rent seeking on the supply side of cathedral building as well, releasing EBCF in resources for private investment. Note that this is in addition to the freed up consumer surplus indicated earlier in figure 8.1.